‘Tis the season for holiday performances, competitions, fundraisers, and school functions. Add the stress of holiday shopping on top of a hectic dance schedule and you’ve got yourself a recipe for short tempers and novels of to do lists. 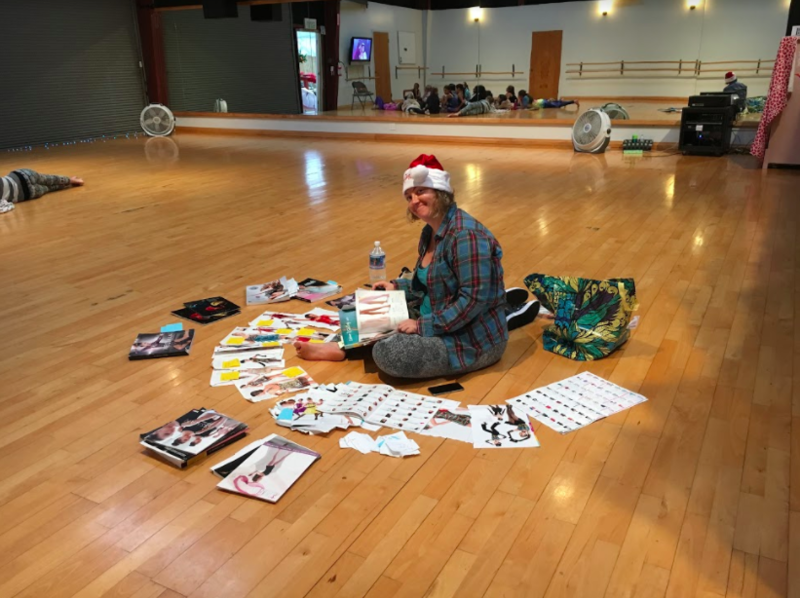 As a dance teacher, choreographer, and artistic director of a studio, I’m here to offer some easy suggestions for teacher gifts this holiday season. It doesn’t have to be as complicated as you think. It’s an honest list. Listen, I’m getting older. My body needs care, my brain is on fire, and I have a lot of knick knacks already. I know a lot of dance teachers that are on the same page. So I created a very honest list. Let it be known that really at the end of the day, you saying thank you to us for our hard work is the greatest and truest and best gift in the world. It’s what we crave, what keeps us going, what helps us on the hard days. It’s what we really need. Always. Every time. Please remember that. This gift is accepted at any time, on any day, anywhere, and we are so thankful when you and your family give it to us. When it comes to physical gifts, we appreciate the thought, always. Always. But if you’re open to feedback, you’ll find this article very helpful. Check out this list of suggestions organized from minimal effort to more organized effort. Dance teachers receive so many goodies around the holidays, and trust me, we appreciate the thought. However, when my students take the time to write out their thoughts for me around the holidays, it’s the gift I cherish most. The holidays are go go go for all of us, but when a child hands you a handwritten card, you stop. You breathe. You read. You cry. You hug them. You keep it on the fridge. I have cards hanging on my fridge from two years ago because they were so meaningful. And if a dance mom or dad does the same? Forget it. I’m a puddle. We appreciate your words of affirmation more than you realize. This year, your words are enough for us. I’m sure you’ve seen us show up with that cardboard cup from the coffee shop down the street from the studio. The baristas know our order by name - caffeine before we teach, tea while we’re in a meeting, baked goods for the other teachers when we’re feeling generous. If that cardboard cup you see us carrying is a Starbucks cup, then thank you very much! If it’s not, chances are we either don’t have time to stop there or we enjoy supporting local business much more, because after all, a dance studio is a local business as well and it’s important we support each other. You are a big part of that support system when you do your holiday shopping this year for your child’s teachers, and I can tell you from experience, I still turn into a giddy little girl when someone hands me a gift card to my favorite coffee shop! You’d be surprised at how much a gesture like that impacts a whole community! Looking around my apartment right now, I can count nine candles that I’ve received in the past year from students, but as I look around, my neck is sore and my back needs an adjustment. Don’t get me wrong, I’m a sucker for a vanilla candle but my body says, lady, you need a massage. If ten families put in ten dollars, you could gift your teacher a gift certificate for a massage this holiday season. Although you may not see us aging as we are hop skip jumping with our creative movement classes, at night our bodies are crying out for self-care and self-care is expensive. One of the best things you can do for us is show us you support our bodies and our self-care and encourage us to make it a priority by gifting us time and funds to put towards it. Extra credit: ask us if we recommend a massage therapist in town, so you can sneakily get the name of our favorite! Then you can give us a gift certificate to our preferred therapist who knows our body and we trust with our bodies! Chances are, your studio owner is in constant need of assistance, help with maintenance, new dance shoes, new paint, you name it. If a few parents are feeling up to it, you could take a week to gather $5-$20 from as many studio families as possible to give a large sum to the studio owner or your dance teacher for what they have mentioned they need. Sometimes, helping to purchase something for the studio takes so much stress off of the director that even though the gift isn’t directly for them, you’ve given them the best gift of all. If you do this one, I suggest filming their reaction because you will never see a more emotional person than if you organize such a gift! Pulling together this sort of studio effort speaks volumes, and reminds the teacher of why they do what they do - for you, their community. A dance parent taking over this process is beyond helpful, trust me! Costco is a great place to facilitate this. A gift card to Lowe’s or Home Depot is brilliant! Do they wear leotards to teach? Discountdance.com. Do they wear athletic wear like Lululemon or Fabletics? They will literally cry if you give them a gift card for clothes that they feel comfortable sweating in for 6 hours at a time. Trust me. Along the same lines as the suggestion that you fund a new _________________________________ for your studio owner or dance teacher, the other option for collecting funds studio-wide is to give a gift certificate for a local hotel or destination outside of your town for a getaway. I will tell you that we can only produce high quality choreography and teaching syllabus when we have mental breaks. The greatest gift you can give us is assistance in taking a break. If you gather $350 across the studio, you could potentially send your dance teacher away for two nights and cover a restaurant dinner. Watch them turn into a puddle as you hand them a weekend getaway, showing your appreciation for all that they do for your children. It will never be forgotten, and it will mean more to them than you could ever understand. In conclusion, I want to say that hands down, homemade ANYTHING - from soap to cookies to ornaments, will never go out of style. Your efforts to create something with your child for the teachers and mentors in their lives is an effort that feels like the true gift, and is appreciated so much. Every thought counts. Trust me when I say, I appreciate every candle, dancer necklace, knick knack, and Starbucks gift card I receive. I am thankful, I see you remembering me this holiday, and taking time to recognize my hard work. Holiday shopping is hard work and I know it to be true. If you’ve already bought your holiday gifts this season - great! Thank you! If you are still up in the air, I hope some of these suggestions will inspire you. They can apply to year round giving, when you may want to give your teacher something after the annual recital or their birthday. We appreciate you, and thank you for your continuous support all year long. Thanking us when you see us, or giving us a hug when you see our eyes bugging out of our head also goes a long way. It’s not always about what you hand us - it’s about that eye contact between classes when you mouth “you go girl” while I shove a granola bar in my face. It’s about that late night when you pick Eloisa up from class and bring me dinner on a paper plate. Honestly, it’s that stuff. This holiday gifts are just so extra. I love you for being a part of our studio, and I hope you know it.